Making a pie crust from scratch is a lot easier than you might think! This holiday season, I’m teaming up with Crisco as part of the Scratch Academy baking school to show you just how easy it can be to make a delicious pie crust from scratch. The Crisco Scratch Academy is a virtual baking school destination to help ignite new life into traditional pie and baking recipes and inspire at-home baking. Home bakers can visit the Crisco Heritage Kitchen site here, to discover new takes on traditional pie classics, baking tips, or find inspiration for their next baking adventure. I ended up using Crisco’s Classic Pie Crust Recipe – it’s well-tested and most importantly, it’s flaky, light, and delicious! If you’d like to make this pie too, you can find the video, recipe and notes below. Enjoy! * Use well-chilled Crisco shortening for the pie crust. I kept mine in the fridge overnight and then chopped it up into small cubes. * When adding your ice water and pulse a few times until the dough just starts to come together. You don’t want a solid dough ball that will be over-mixed. You want to be able to press it and have it form a dough. Overworking the dough will leave you with a tough pie crust. * Make sure you’re using pureed pumpkin and not pie filling. * Make sure the oven rack is on the lower third of the oven. * Place your pie onto a baking sheet to save the oven from possible spillovers. * I like to place a pie crust shield onto the pie to protect the edges from getting too brown. If you don’t have one you can cover the edges with aluminum foil. * Butter Flavor and All-Vegetable Crisco® Shortening and Baking Sticks deliver higher, lighter-textured baked goods and have 50% less saturated fat than butter and zero grams trans fat per serving. * Celebrating its 10th anniversary, for the first time, home bakers can also seek help online by visiting www.piehotline.com. Note: I can no longer edit the recipe plugin I use, so please note I forgot to put the following in the ingredient list: 2 eggs, 2 cups of pumpkin puree, and 1/2 teaspoon of grated ginger. The video and description include when to use them. Blend flour and salt in large bowl. Cut shortening into flour mixture using pastry blender or fork. (Another option; I like to use a food processor). Stir in just enough water with fork until dough holds together. TIP - Test dough for proper moistness by squeezing a marble-sized ball of dough in your hand. If it holds together firmly, do not add any additional water. If the dough crumbles, add more water by the tablespoonful, until dough is moist enough to form a smooth ball when pressed together. Shape dough into a ball. Wrap dough in plastic wrap. Chill for 30 minutes or up to 2 days. Sprinkle your surface, dough and rolling pin with flour and roll your dough out, starting from the center and gently rolling outwards. Lift your dough periodically and move it around, to make sure the bottom isn’t sticking. You may have to occasionally put more flour on your rolling pin and work surface. Roll the dough into a circular shape. It should be about 2 inches wider than the pie plate. Roll the dough loosely onto the rolling pin, brushing the excess flour away with a pastry brush, and transfer the dough to the pie plate, gently patting the bottom into the corners of pie plate. Pat around the top edges, lightly pressing the dough onto the pie plate. 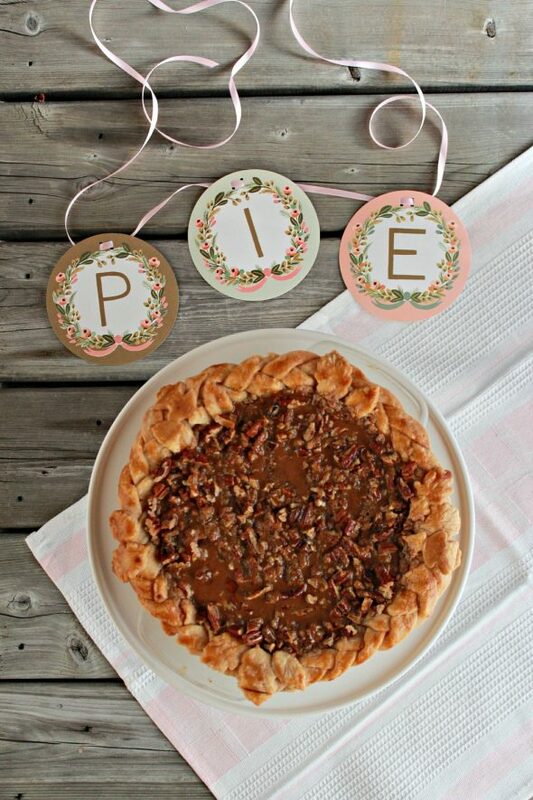 Take a knife and go around the pie plate, cutting off the excess dough hanging over the edge. There are lots of different ways to finish off the edges of a pie such as pinch crimping, fork crimping and pastry cut-outs. For a braided edge, roll and cut the remaining pastry into 12 long thin strips, of about ¾ of an inch or 2 cm width. Braid the strips. You’ll need about 4 braided pieces. Brush the rim of the crust with beaten egg. Lay the braids on the edge, gently overlapping the pieces together. Cut out a few leaf shapes with a leaf cutter and place on the seams. Brush the braids with beaten egg. Preheat your oven to 425°F. Make sure the oven rack is on the lower third of the oven. Place your pie onto a baking sheet to save the oven from possible spillovers. I like to place a pie crust shield onto the pie to protect the edges from getting too brown. If you don’t have one you can cover the edges with aluminum foil. 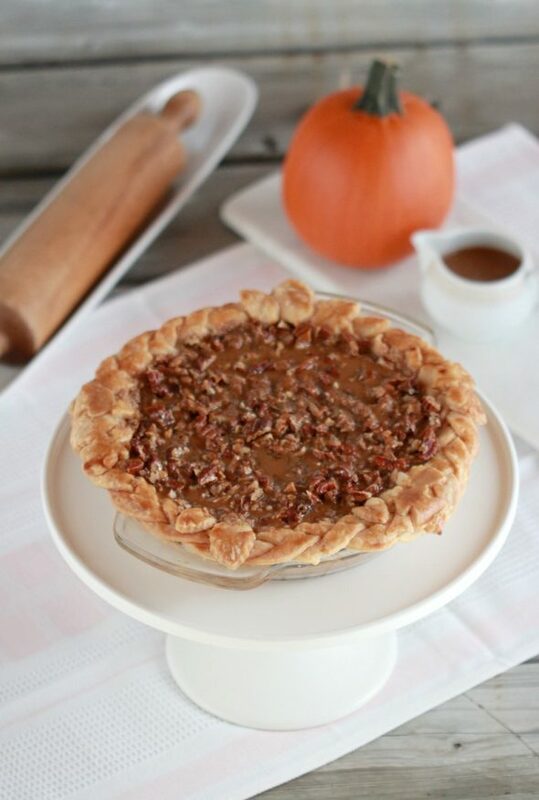 Pour the filling (recipe below), into the pie and bake at 425°F for 10 minutes, then reduce the heat to 350°F and continue baking until the outside of the pumpkin filling is firm, and the middle isn’t quite set, for approximately 1 hour. 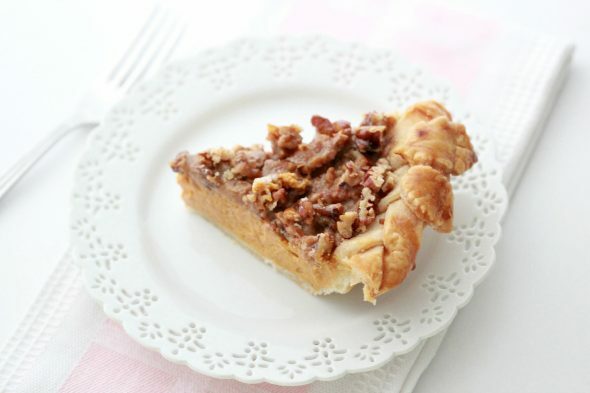 Take your pie out and pour the pecan streusel (recipe below), on top and bake for another 15 minutes to brown and melt the streusel. Let your pie cool completely. Ideally, leave it in the fridge overnight. See finishing touches - dulche de leche, below. Mix ¾ cup sugar, ½ teaspoon salt, 1 teaspoon ground cinnamon, ½ teaspoon powdered ginger and ¼ teaspoon cloves in a small bowl and set it aside. In a large bowl, beat 2 eggs and stir in 2 cups of pumpkin puree (Stir in ginger here if you're using grated ginger). Stir in the spice mixture. Gradually add one 12 ounce can of evaporated milk. Set your filling aside until you're ready to pour it into the pie shell. Combine ½ cup brown sugar, ¼ flour, ½ teaspoon cinnamon and a pinch of salt. Cut in 6 tablespoons of Crisco butter-flavored shortening with a pastry cutter or fork, until crumbly. Stir in 1 cup of chopped pecans and place in the fridge until you need it. Just before serving, warm dulce de leche in the microwave or in a saucepan on the stovetop until loosened. 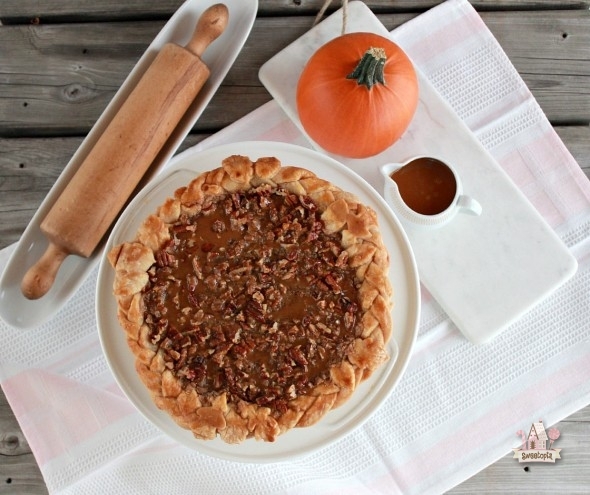 Pipe or drizzle about ½ cup over the top of the pumpkin pie and enjoy! Recipe taken from Crisco.com, the Classic Crisco Pie Crust – Deep Dish Double Crust. Such a great tutorial, Marian, so much effort you put into it but this is how people really get to see how it’s done, so so helpful! p.s. this recipe is easily switched into a vegan version by using an egg replacer and vegan dulche de leche <3 So good! Thanks for the great instructional video. I’ll be trying this out soon! Have a great autumn! This is an excellent tutorial. The way you are showing it is the best way to learn how to do a beautiful looking and sure testing pie. Thank you for sharing your expertise. Very nice video too. Have a great weekend now. I love this blog and the pictures and recipe are awesome! I really like how you took us through each step and provided us your tips and tricks! I will definitely be trying this recipe out! Thanks for sharing! You never cease to amaze me. Cookies, Cupcakes and now pies! Wow! Thanks a lot for the video! Looks so easy when you do it! Will have to try this myself. Hi! Can’t wait to try this, hubby is a huge pumpkin pie fan. Just a small fix – it’s Dulce de Leche (minus the extra “h” in Dulce). 🙂 love all your cookie recipes! Big hits in this house! It turned out AMAZING!! This will be my go-to pumpkin pie. Absolutely delicious 🙂 thank you so much! !